A tenant's dog that injures someone can hurt the landlord or property owner too. There always is an issue when a tenant has a dog. The issue is whether the landlord knew about the dog, and how much was known about it. If the dog hurts someone, the tenant who doesn't have renters insurance can lie and say that the landlord was aware of the dog, which would shift the focus of the case to the landlord as the only one with insurance. Or the tenant could assert that the fence or gate was defective and claim that the landlord promised to fix it. 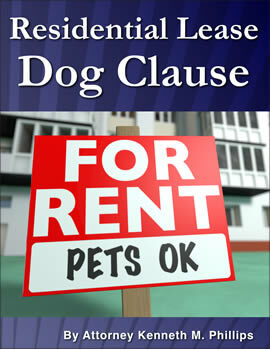 The Residential Lease Dog Clause can protect a landlord from dog bite claims, but is not a substitute for insurance, and like any legal agreement should be reviewed by your own attorney. Nothing can guarantee that you will not be sued or that you will win every case, but the Residential Lease Dog Clause can decrease the odds against you.